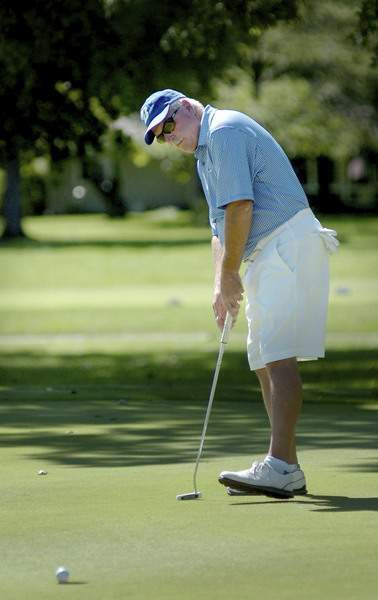 File Tom Wood, who will tee off at 12:20 p.m. Sunday in the Senior City Championship, putts on the eighth hole at Coyote Creek. Defending champion: Sam Till Jr.
Tee times: 11:30 a.m.-12:50 p.m. There are a few things you need to know about Coyote Creek Golf Club – the site of the Senior City Championship on Sunday and Monday – and the first is that there are, indeed, coyotes out there. “Sometimes in the morning, really early, you'll see a couple of them roam across the fairway,” said Bill Blumenherst, the club's PGA director of golf, adding that last year there were some pups that had taken a liking to playing with tee markers on the 13th hole. But long before Coyote Creek was called Coyote Creek, it was known for something much different – it was the place that legendary golfer Arnold Palmer pocketed his first paycheck as a professional. It was 1955 and Palmer earned $145 for placing 25th at the Fort Wayne Open at what was then known as The Elks, a course with history that could be traced to 1929. “There is a lot of history here,” Blumenherst said. That includes Steve Vernasco winning the Senior City – run by the Senior Golf Association of Fort Wayne – when it was last played at Coyote Creek in 2016 when he posted a two-day total of 5 under, including a final-round 2-under 70. Last year's champion, Sam Till Jr., who won for the sixth time, finished at 4 over with a final-round 1-under 70 at Orchard Ridge Country Club. For those coming out to watch, take particular note of the par-4 sixth hole. “You have to hit two really good golf shots,” Blumenherst said. “It's downhill off the tee, and you've got to hit a little baby fade. You've got to place it off the tee short of the creek. And then you have a beautiful shot across the creek and, once again, you have to shoot a very accurate second shot onto that green and then hold it because it does have one of those false fronts. For those in the championship flight, the course will be set up to play about 6,200 yards. “I've always been a believer that when they leave your golf course from a tournament standpoint that they say, 'Wow, that was set up fair and that was fun,'” Blumenherst said.